A is for Anti-Christ. See B & O. 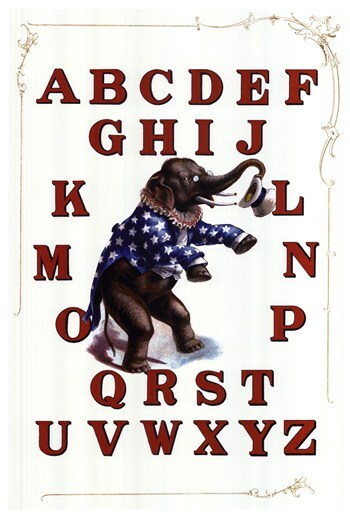 B is for Barack – Isn’t that an “exotic” name for a President? George, Ronald and Sarah are far more American sounding. C is for Christ, who informs all of my decisions, including the ones where I discriminate against the poor and sick. Just like He would! D is for Death panels and they’re coming to unplug Grandma! E is for Electoral campaign finance reform. AHAHAHAHAAHH! Just kidding! The letter E is brought to you by, well, I don’t really have to tell you that anymore, do I? F is for Fascism!!! BE READY TO VIOLENTLY FIGHT THE FASCIST LIBERAL GOVERNMENT AT ANY TIME!!! Nothing bad ever happens when you live your life by this doctrine. If it does, it’s an isolated incident (see I).